The announcement of awards is an essential element of the whole youth summer camp experience and is as universal as camp songs, awkward uniforms, and cold swimming pools. As such, it can be worth putting thought into exactly what your camp’s contests and awards will be for this year. In this month’s post, we at Spike’s Trophies, the go-to trophy company for the DE area, are offering a helping hand by pitching some ideas for summer camp awards and challenges. The Cheerleader Award. This doesn’t have to refer to an actual cheerleader. A Cheerleader Award could also designate the camper who is the biggest “cheerleader” and supporter of kids, whether they’re giving emotional support to the other campers, helping them out with tasks and crafts, or offering encouragement to others in their personal goals. As for the perfect award, you might consider our 2” 3D Cheerleader Medal. The Drama Award. This can be taken figuratively or literally. At a drama camp, this award could be given to the camper who is the most talented, practiced the most, or showed the most improvement. Otherwise, the Drama Award could even be affectionately given to the most drama-prone kid in the form of our 3D Drama Medal. The Peacemaker Award. This could go to a camper who has distinguished themselves in their conflict mediation skills. 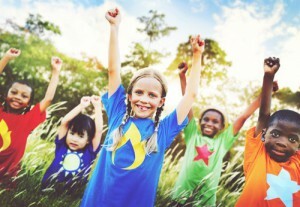 Indeed, quarrels between kids tend to flare up quite a lot in many summer camps. Kids who have demonstrated an ability to intervene by calming down both sides, talking through their issues, and facilitating peace among campers are certainly deserving of an award for their developed social skills. The 3D Shaking Hands Medal from Spike’s Trophies might be just the ticket. The Most Improved Award. This could be for anything, really. Whichever camper showed the most improvement in fitness, behavior, some sort of skill or craft, attitude, or who showed the most progress in sports or drama could be a contender for Most Improved. As for a tangible reward, our 3D Achievement Medal featuring a hand triumphantly holding an Olympic torch aloft may be an excellent fit. This is not to mention Spike’s Trophies also offers customized medals, trophies, and sports plaques for New Jersey, Delaware, Philadelphia, and surrounding communities. Are you interested in learning more? Give Spike’s Trophies a call today at 855-652-4030! This entry was posted in Uncategorized on August 6, 2018 by Spike's Trophies. It seems that every time a discussion about work-ethic, achievements, and accolades is brought up, it always ends with a chastising remark geared towards the millennial generation. There is no generation, maybe besides the Baby Boomers, who are analyzed quite like how millennials are. As leaders in the New Jersey and Pennsylvania sports trophy business, we understand just how crazy things can seem to be with millennials and their participation trophies; but we want to take some time to shed light on the importance of recognizing millennial employees in your company. While not singular to millennials yet very prevalent in their generation, millennials crave the sentiment of showing up to work for a purpose and role that aligns with their values and extends past the paycheck. It’s unlikely that a millennial will work on a project or assignment that they do not fully understand the “why” behind. It’s best for managers at companies who hire millennial workers to explain the rationale behind the importance of the project for extra fuel to get the job done. The team at Spike’s Trophies can use their abundant supply of strong material to create custom awards with stunning designs. Maybe your company is looking to have an award made out of crystal, metal, or acrylic? No matter the style and design, all of the plaques and trophies from Spike’s are customized to each clients’ individual needs. Your business can choose exactly what you want to be inscribed on the award and in what style of font. This trophy and award supplier houses the talent and technology available to implement your company’s logo onto a multitude of products, to conceive branding gifts for employees, clients, and partners. When you turn to Spike’s Trophies, you aren’t limited to awards with your logo printed on it. As the leading PA & NJ sports trophy supplier, we can handle customized orders on items such as USB flash drives, keychains, foam footballs, drawstring bags, mugs, and much more. To learn more, head to our showroom in Center City or call 855-652-4030 today! Spike’s In the News: Awards & Personalization Association Chooses us for Insights Magazine feature! Spring Fever in Philadelphia: Can The Phillies Go All the Way?